I’ve been having this conversation with my brother a lot. It starts out, “Who do you think is the best quarterback in the NFL?” It usually ends with Alex saying Russell Wilson, and/or Robert Griffin III. 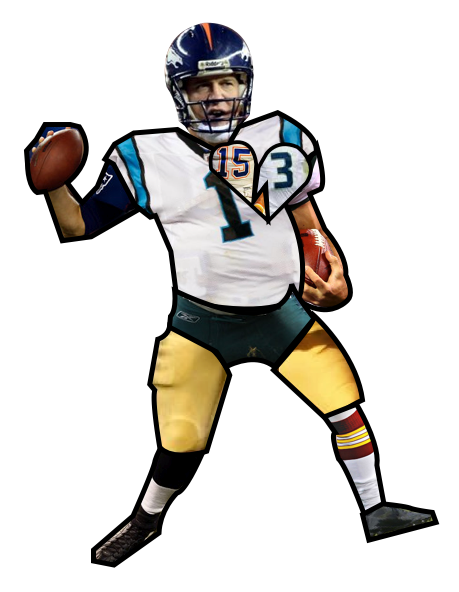 I would like to point out that no quarterback can be perfect, and with that thus pointed out, I would like to attempt to combine the best parts of several of the best quarterbacks to make the perfect quarterback. This quarterback can run and pass. It can read defenses, and make the play to defeat them. The Head: Peyton Manning. With his eyes dissecting the defense there isn’t a chance for the other team. Manning is the greatest authority regarding plays to beat the defense. With Manning’s knowledge of the game, the quarterback will be able to force defenses to think twice before daring him to run. The Arm: Tom Brady. With Brady’s arm, the accuracy, and power will be perfect. Tom Brady has proven time and time again, that he can throw the ball to receivers who are draped in defenders. His accuracy extends to the deep ball, and he can drop the ball into the perfect spot, and does it on a consistent basis. The Love of the Game: Tim Tebow. This man wants to do anything he can to help his team win. If that meant long-snapping, he’d do it. But instead he was able to pursue his dream as a quarterback. Built more like a full back though, he did what he was best at to help his team: run the ball. He’s the perfect example of a football player. The Upper Body: Cam Newton. Cam Newton is a big boy. According to NFL.com Newton is 6′ 5″, weighing 245. I’ve seen rosters and trading cards that have his height at 6′ 6″ (I’ve actually seen 6′ 7″, too). That’s huge. To top it off he’s super strong, too. With Newton’s upper body and core strength the quarterback would be nearly impossible to tackle. The Hips: Mike Vick. If you’ve ever watched a game that Michael Vick participated in, you’ve seen something special. Vick is a quarterback who takes advantage of a stereotype. He drops back to pass, the receivers are covered, he runs. What makes him special is his ability freeze defenders. Vick has incredible agility, and can shake his hips to fake one way, and then, a millisecond later, he flips his hips and is taking off, leaving the defender in the dust. Lower Leg Agility: Robert Griffin III. Griffin is quite the athlete. He always reminds me of the few videos I’ve seen of Doug Flutie playing football. His legs, though, are far superior. Where Flutie could run, Griffin has ankle breaking cuts, and change of direction skills that are far beyond anything I’ve seen quarterbacks do. Besides that he’s pretty fast 🙂 I made the rule that you can only be in one category. So, Mike Vick is in this category too, just in spirit. Our little Frankenstinian creation doesn’t look pretty, but I’d say it’d get the job done. With all of these attributes defenses would have to double spy on the quarterback (because of the running ability) and that would force the defense into man coverage, with no safety help. That would be easy pickin’s for the perfect quarterback.